All Souls’ Day (Los Fieles Difuntos), on November 2, and All Saints’ Day (Día de Todos los Santos), on November 1, are bigger than Halloween in Mexico. It’s also called the Day of the Dead (Día de los Muertos). In honor of friends who have passed, Projekt put the collaboration between the late Mexican Jorge Reyes and very alive American Steve Roach on name-your-price download at Bandcamp. And the CD is on sale for $10. Conjuring images of a primal futurism, this alchemical blending-of-sound is a ceremonial offering to the forgotten gods. The Ancestor Circle is a new tribal-ambient-electronic collaboration, the first recording from Roach & Reyes since Vine ~ Bark & Spore (Timeroom 2000). This is the lost chapter of a long soulful journey that has taken twists and turns in its unfoldment. The music feels steeped in a frothy mind-altering blend, waiting for years as the potency increased. Roach & Reyes combined their instinctual nature — developed over almost a decade of worldwide live and studio adventures — leading up to the core of what became The Ancestor Circle. It is in this circle that their sound is unearthed from deep within their primordial soundworld, where prehistory meets future-tech creating a sound impossible to carbon date. Like the audio artifacts of a lost tribe, the studio source recordings that form this album’s foundation were uncovered in 2013 on a cryptically-marked set of tapes. Created the week before Roach & Reyes’ May 2000 concert at Tucson’s Temple of Music and Art, this is their last joint studio project as Reyes passed on to The Ancestor Circle in 2009. Jorge Reyes took an ethno-musicological approach to music-making on 20 solo albums; released throughout the late 80s, 90s, and 00s these albums all has a special emphasis on indigenous and shamanic traditions from Reyes’ native Mexico. After years of tirelessly performing across Europe, he met Roach in the early 90s at a festival on the Canary Island of Lanzarote. Along with the Vine ~ Bark & Spore collaboration with Roach, Reyes & Roach teamed with Spanish electric guitarist Suso Saiz for two mid-90s albums from their group project, Suspended Memories (Music From The Hearts of Space 1993 & 1994). Reyes passed away on February 7, 2009. Steve Roach is a pioneering cornerstone of ambient-atmospheric-electronic music with over 100 albums to his name. Since the early 80s, Roach has approached music like a medicine man approaching the void: engaging the challenge, uncovering new mysteries, and bringing them back to share with the world. From the expansive, time-suspending spaces reflecting his spiritual home in Arizona to the fire breathing, ethno-ambient expressions woven from all things electric and organic, Roach’s long list of groundbreaking recordings are fueled by his prolific nature and uncompromising approach. Before it even begins, The Ancestor Circle has its own air of mystery. The source material comes from “cryptically marked tapes” Roach found in his studio in 2013. Turns out that these were recordings Roach made with Jorge Reyes in 2000, at the time of their collaboration Vine~Bark & Spore, prior to a concert in Tucson. The Ancestor Circle recaptures what may be my personal favorite collaborative chemistry in the Roach catalog, the deeply primitive, ritual-driven desert-ambient meditations. This is the sound-set that forms the basis of some of my go-to albums, including the superb Suspended Memories outings featuring Roach, Reyes, and guitarist Suso Saiz. So listening to this puts me, quite blissfully, in familiar territory. The depth of sound, as always, is stunning. Analog pulses with a cool rubbery consistency lay down the beat framework, incense-smoke pads whisper like wind in the background. Wordless chants pack shamanic potency, a call to open the space. There is a wonderful twilight darkness to it; not cloying and oppressive but the darkness of our own primal spirits, the one still connected to our animal self. Roach has taken the source material, fleshed it out and tied it together into a continuous flow that pulls the listener in and down and keeps them there. This is certainly a space in which to lose yourself–or, you see, to find a version of yourself. In terms of the years-long evolution of Roach’s tribal ambient and desert ambient styles, The Ancestor Circle represents a vital component that had gone missing, but now slots perfectly into the narrative and builds on what already existed. What’s more, it is a fitting tribute to the talent and voice of Jorge Reyes, who left far too early in 2009. A must-have for Steve Roach completists, and a must-hear for anyone into tribal. Steve Roach y Jorge Reyes, ¿qué decir de estos dos músicos? Cada uno de ellos en solitario, su música nos transporta a otros lugares, en combinación, simplemente, era algo sublime, por desgracia, esta conjunción no se podrá volver a reproducir en este plano terrenal ya que el gran Jorge Reyes no se encuentra entre nosotros. 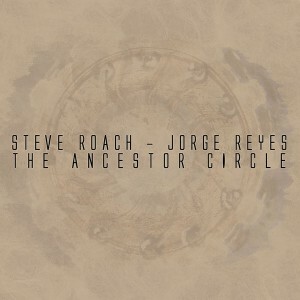 The Ancestor Circle, publicado en el año 2014, está formado por temas encontrados en unas cintas grabadas una semana antes del concierto que en Mayo del año 2000 dio Steve Roach con Jorge Reyes en Tucson, al localizar dichas cintas, Steve pensó que nada mejor que el espíritu de Jorge siga viviendo en ese círculo y creó éste trabajo. Steve Roach a los sintetizadoress tanto analógicos cómo digitales y también con la ocarina y Jorge con las voces, ocarinas, flautas indígenas prehispánicas y percusiones. La música de ambos compositores siempre ha combinado a la perfección, sus estilos cuadran de forma excelsa y siempre que se juntaban eran capaces de recrear unos espacios musicales que se fundían y nos llevaban hasta el infinito, de ello pueden dar buen detalle todos aquellos que tuvieron oportunidad de acudir a sus espectáculos en directo. Éste trabajo, es un fiel reflejo de lo comentado, Steve va creando sus atmósferas electrónicas y Jorge, con sus percusiones y voces nos introduce en esos mundos místicos que tan bien eran capaces de recrear. Más de setenta minutos repartidos en seis temas de puro sonido ancestral para sumergirnos en ese círculo, un trabajo que todos los seguidores de ambos músicos deberían de tener. Jorge, allá dónde estés, gracias por todo lo que nos has aportado y gracias a Steve Roach por deleitarnos con éste maravilloso recuerdo. Variously described as shamanistic, devotional and tribal, the electro-acoustic music of late Mexican musician Jorge Reyes (1952-2009) often gets filed under “world music”. Close inspection reveals something quite different, however. There is a mysterious, earthy intensity to his work that’s an exception to the light, semi-commercial fare that usually sits under the world music banner. This quality is often at its most visceral when he sings and chants amid the percussion, flutes, occasional synthesisers, and sundary other native instruments that make up his exotic sound. So, where to start for newcomers? Reyes complete discography was elusive for many years – only certain albums seemed available at all – but now pretty much everything he released can be found on CD or download. There are some 20 original albums dating from the mid 1980’s to the late 2000’s, plus compilations, and he rarely made a lousy record. Following below are some good introductions. Although he was not a Mexican indian, Reyes played many Prehispanic instruments, having being exposed to them from an early age in the village where he grew up. This influence permeates most of his output and the four volumes in his Prehispanic/pre-Columbian music series are an excellent place to start: Rituales Prehispanicos from 1996, plus three other albums from the same decade that are now available as a 3CD compilation set simply called Prehispanic Music. Many tracks from these releases find him playing a mix of found and borrowed instruments and not at all concerned with standardised tunings, exploring ancient sound spaces in his own personal way. We don’t know exactly what early Prehispanic music sounded like, of course, and that’s not the point. Reyes’ art is pure but he was not a purest. It’s about the performance. The feeling is positively primal at times – sometimes aided by the airy, drifting, dark hues of synthesisers – and epic at others, such as the swelling strings that cushion the big tribal groove of “No Te Entiendo”. The four albums above are compilations of sorts, drawing some of their tracks from other Jorge Reyes releases and as such they provide a decent sampling of the breadth of his work. That said, a number of other releases collectively make an equally good introduction. His early solo albums are generally more melodic than his later ones and show a progressive rock influence, not surprising given that he played in several prog rock bands in the 70’s and early 80’s. Comala from 1986 is a fantastic example; a brilliantly wacked-out combination of prog rock, psychedelia, tribal grooves, jazzy improvising, chants and other Mexican folk flavours. Niérika from the same period is another outstanding release, equally eclectic but a little more restrained and polished. Fast forward to the mid 90’s, by which time the tribal side of Reyes sound well and truly occupied centre stage. The Flayed God is a rare and wondrous thing: an album of tribal exotica that engages and enthralls from beginning to end with almost no reliance on tonality, chords or melodic lines. What moments of melody do exist on the album – the flutes for example – are played not using a Western seven-note scale but a “natural tuning”, which essentially means the instrument’s original maker punched the holes where they felt right. Reyes’ 1996 album Mort Aux Vaches is also outstanding, albeit more tuneful, and contains some stunning vocal work. “Plight” captures the singer at his most sensual and restrained, accompanied by simple live percussion and gorgeous, understated synthesiser drones. The 1990’s also saw a number of significant collaborations between Reyes and American ambient musician Steve Roach. Together they spearheaded the rise of electronic tribal ambient music, a dark and deep electro-acoustic hybrid that today commands a massive worldwide following. Defining ambient artist Steve Roach has a long history of tribal-infused atmospheric music throughout his thirty-plus year career, and one of his latest releases is another subdued and hypnotic mix of ancient and future sounds weaving together. The basic elements of this work were recorded back in 2000, with Roach unearthing the original tapes again in 2013. 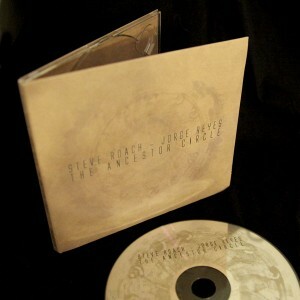 `The Ancestor Circle’ is another joint effort with fellow ambient artist, the late Jorge Reyes, the pair having collaborated numerous times since the early Nineties right up until his passing in 2009. Tribal elements seamlessly blend with modern electronics here, sounding like a mix of both future and past. Don’t expect much in the way of melodies or anything resembling obvious tunes – `The Ancestor Circle’ presents a slowly unfolding selection of hypnotic instrumental soundscapes and immersive tribal drones, deeply atmospheric and meditative, with little welcome traces of darkness and edge emerging in a few moments as well. With a huge inhaling gasp of air, `The Circle Opens’ takes in all manner of heady potions and natural hallucinogens, a concoction of mellow synth washes weaving around deep-throated groans. A trickling loop peppers the background, sighing synths float like a gentle stream and spectral voices spiral into infinity. Darker elements try to take control throughout `Espacio Escultorico’, a constantly building tribal drum-beat pounding behind quivering wordless vocal cries, abstract sheets of electric guitar feedback and forceful electronic walls of synths trying to consume and dominate. There’s a breathless, almost maddening and intimidating quality here, as if you’re hearing bad spirits barely being kept at bay by positive forces. Low-key electronics slink alongside reflective flute throughout `Spirit, Stone and Bone’, ancient past and promising future collide with subtle hypnotic grooves and gentle psychedelic strangeness on `Procession of Ancestors’, and the electronic strums filled with purpose on closer `Temple of Dust’ effortlessly turn reassuring and freed, like a lost spirit joyous in finally earning peace. But it’s the ambitious `Memories Unsuspended’ that leaves the biggest impression. A twenty-four minute extended composition, it’s a hugely confronting and emotionally exhausting mix of unceasing heartbeat-like cold machine robotic loops duelling with fragmented vocal reverberations. It’s as if the cold, busy, hedonistic and Godless modern world is trying to dominate and violently attack the spiritual ways of old. Bombarded with temptation and selfishness, those machine hisses move up and down in tempo to raise the pulse, sometimes transforming into slinking grooves around restrained cinematic-like swells and ethereal wisps of guitar strains. It’s a haunting, deeply moving piece, and the brief darker strains of the final few minutes remind that those temptations and negative elements are always there, but you have the ability and self-belief to defeat them on every occasion. Only time will tell if further unfinished or unreleased collaborations between Roach and Reyes will emerge, but if this turns out to be the last of their work together, then the late artist would be very proud of the finished results. There are occasional accusations that some of Roach’s albums show repetition or have a similar sound, but it’s best to simply approach each individual release and view it on its own merits. Each album released by the artist has its own unique identity, and it’s up to fans and listeners to discover which ones mean the most to them. But in this case, `The Ancestor Circle’ achieves a frequently perfect unity of tribal elements and subtle electronics, and for his final release of 2014, Mr Roach still maintains his incredible and consistent recent streak of superb ambient releases, so once again just let his music wash over and completely envelop you. Every new Steve Roach recording shares, it seems, certain properties with the voluminous number preceding it: though indexing suggests the presence of individual tracks, the material on a typical Roach release unfolds without pause for somewhere in the vicinity of seventy minutes. The music is permeated by a strong sense of meditative drift, and exotic aromas of the type associated with World Music emanate from the music’s pores. Also characterizing Roach’s tribal-ambient-electronic fusion is an out-of-time quality, the feeling that the shaman’s ritualistic music could just as legitimately be deemed primitive as well as contemporary or even futuristic. All of which is a roundabout way of saying that The Ancestor Circle amounts to a seamless addition to Roach’s ever-expanding discography. It is special in one distinct way, however: while it’s the first collaboration from Roach and Jorge Reyes since Vine ~ Bark & Spore appeared in 2000, more importantly The Ancestor Circle is their final joint studio project given that Reyes passed away on February 7, 2009. 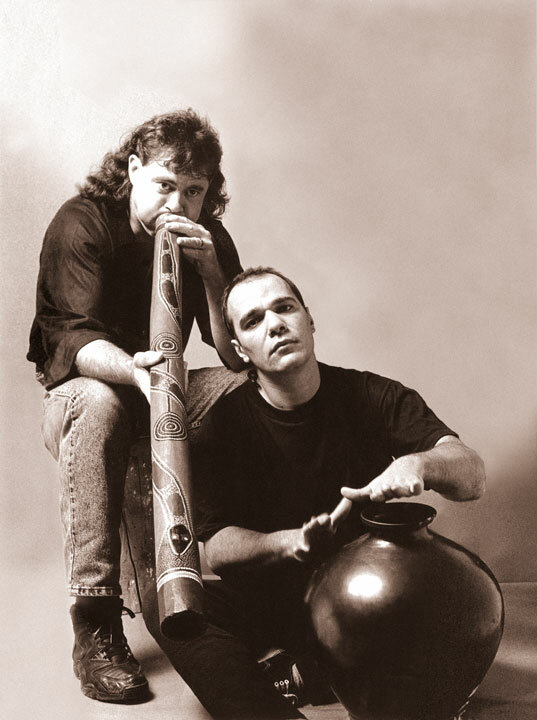 It’s easy to see why Roach and Reyes make such a natural pair: like Roach, Reyes invested his music with an ethno-musicological sensibility, and the twenty solo albums he issued during the ‘80s, ‘90s, and ‘00s drew heavily on the indigenous traditions of his native Mexico. On this seventy-four-minute collection of new “medicine music,” Roach is credited with synths (analog and digital), ocarinas, percussion, guitar, trance grooves, and “spirit air”; among the sounds Reyes contributes to the recording are pre-Hispanic flutes and ocarinas, vocals, tarahumara drum, percussion, and guitar. That list alone suggests much about the sonic character of a primal-futurism project that thematically symbolizes “a ceremonial offering to the forgotten gods.” Throughout the trip, Reyes’ wordless vocalizing rises from the music’s mutating surfaces like the plaintive chanting of a tribal elder, while flutes warble amidst heat-scorched landscapes liberally strewn with percussive accents and myriad electronic flourishes. The various instrument sounds, while emerging within the mix as distinct elements, operate as strands within a dense, shape-shifting whole that organically evolves at a well-calibrated pace—neither too slow nor too fast. Negli ultimi tre anni Steve Roach sembra aver deciso di rinnovare tutti i suoi sodalizi artistici più longevi. Così, dopo il ritorno al fianco di Dirk Serries per Low Volume Music e il nuovo capitolo con Byron Metcalf Tales From The Ultra Tribe, è ora la volta del comeback postumo assieme a Jorge Reyes, uno dei primissimi collaboratori del maestro californiano in tema etno-ambientale, tristemente scomparso nel 2009 (basti citare la sua presenza nei due parti dei Suspended Memories, datati rispettivamente 1993 e 1994, per rendere l’idea dell’arco di tempo abbracciato dal loro sodalizio). The Ancestor Circle raccoglie brani risalenti alla preparazione della performance a Tucson, pubblicata anch’essa su disco l’anno scorso: ben quattordici anni fa, più o meno il medesimo periodo in cui i due lavorarono al deludente e spento Vine~Bark & Spore, dove già le pulsioni ambient-trance ricoprivano un ruolo fondamentale. I soundscape una volta dipinti a suon di percussioni sono qui affidati ad arpeggiatori ipnotici, chiamati a dare il La ritmico all’alternarsi/fondersi dei tipici flussi di sinewaves del californiano e della voce gregoriana del compare messicano. Ne escono sei intensi affreschi ambientati in una foresta spiritata, fra i quali il monolite “Memories Unsuspended” ambisce senza mezzi termini allo status di capolavoro, bilanciato alla perfezione fra groove trancedelico e malinconia terrena. È l’ennesimo saggio di maestria ambientale ed evocativa, che va qui attribuita almeno per metà anche a un Reyes protagonista dei sussurri amazzonici che delineano il paesaggio fisico. Un gioiello da incastonare fra i più preziosi e riusciti della sconfinata produzione del californiano. It was February 7th, 2009 when Jorge Reyes, one of the leading lights of the Mexican ambient music scene left this world. Parallel with his participation in one of Mexico’s most popular bands Chac Mool, founded in 1980, he had released a long string of albums focusing on fusing ambient electronic music with prehispanic sounds, many of which were collaborations with like-minded travelers like Suso Saiz, Antonio Zepeda, Francisco Lopez, and Steve Roach. For a period of time he formed (along with Saiz and Roach) the ambient / tribal supergroup Suspended Memories, who released two excellent albums in the early 90s. La collaborazione fra il decano californiano e quello messicano delle sonorità ambient, rispettivamente il ben noto Steve Roach ed il purtroppo scomparso Jorge Reyes (stroncato da un attacco di cuore nel febbraio 2009, all’età di 57 anni), ha radici lontane che vanno indietro sino ai primi anni ’90, allorquando i due, assieme al chitarrista Suso Sáiz, realizzarono un paio di lavori col monicker Suspended Memories. Nel 2000 Steve e Jorge realizzarono, attraverso la Timeroom Editions (label gestita dallo stesso Roach), l’album Vine – Bark & Spore, collaborando anche dal vivo con una certa frequenza. La Timeroom Editions ha poi pubblicato lo scorso anno – in formato digitale – un live registrato dai due a Tucson nel 2000, e proprio una settimana prima di quell’evento vi furono delle sessioni di registrazione, i cui nastri risultanti sono riemersi solo nel 2013. Roach ha messo mano a quel materiale per completarlo a dovere, rendendo The Ancestor Circle il degno testamento artistico della propria avventura al fianco di un musicista del calibro di Reyes. Il periodo di riferimento è dunque lo stesso del primo album dei due, coi compiti sempre ben divisi: da una parte Roach, impegnato per lo più (ma non solo) con l’apparecchiatura elettronica, e dall’altra Reyes, che controbilancia in maniera organica occupandosi di voci, flauto preispanico, ocarina, chitarra elettrica e percussioni. This CD from 2014 features 73 minutes of tribal ambience. The source recordings that comprise this album were discovered in 2013 on a cryptically labeled set of tapes from a week before the Roach/Jorges concert at Tuscon’s Temple of Music and Art in May 2000. Roach plays analog and digital synthesizers, hybrid trance grooves, ocarinas, ambient percussion, processing and looping, textural guitar, and spirit air. Jorges plays: prehistoric flutes and ocarinas, voice, ambient percussion, tarahumara drum, electric guitar, and looping. From instrumentation and titles, one can correctly presume this music explores a realm of antediluvian tribal harmonies, the type found in primitive nocturnal ceremonies and you’d be right. The tuneage is sparse and harmonic and moody, but the introduction of modern technology to the mix gives everything a futurist flavor. While there are different song titles, the tracks run together into a seamless flow. The beginning employs ethereal tonalities to establish a vaporous vista that hosts temperate soft beats and eerie chittering sounds. These latter contributions form a sighing tapestry that lends elusive definition to the music’s atmospheric foundation. As things progress, substantial electronics emerge, bestowing a periodic intensity to the flow. This continues, eventually joined by randomly vibrating chimes and shushing pulsations. Ghostly voices swim into play, remote and celestial in their intonations. These voices engage in some resonant acrobatics amid a rising tide of blooping electronic grooves. The vocal effects and the grooves interweave playfully but solemnly, creating a passage that fuses tribal ethics with computerized influences. While the voices persist (yet seem relegated to the background), the electronic pulsations reign dominant (while remaining gentle and fluid). Eventually, the flow reverts to an ambient presence. Tenuous textures roil and occupy the stage, shuddering and gradually mustering some definition, until one pulsation emerges to guide the tuneage into a passage marked by mounting rhythms and an array of peripheral effects that become progressively pronounced, as does the urgency of the quasi-muffled percussion. Warbling strains of a flute creep into prominence, establishing a crepuscule mood that is further enhanced by a resurgence of a tribal drumbeat attended by spiritual sounds of electronic origin. Ultimately, the music slides into a stretch of extreme ambience, with textural clouds punctuated by sparse effects. The circle opens with hootings. The roarings of the winds from “The Circle Opens” rage of their scarlet rustlings in a slow sonic tornado where the percussions are cawing like some big bullfrogs and where the synth lines let filter sibylline chants that the winds flog of fine wrinkles of electric smoke. The rhythm is ambient. It waddles like a delicate contemplative tribal trance under the rustles of arrhythmic percussions, as tribal as organic. It lulls itself without ambitions none, except to maintain its ambient effect, under the humid breezes of dark caves where stroll voices of spectres. Like an astral journey where souls moisten the walls of the memories, “The Circle Opens” introduces us in this unexpected collection of a music forgotten in the vaults of Timeroom. 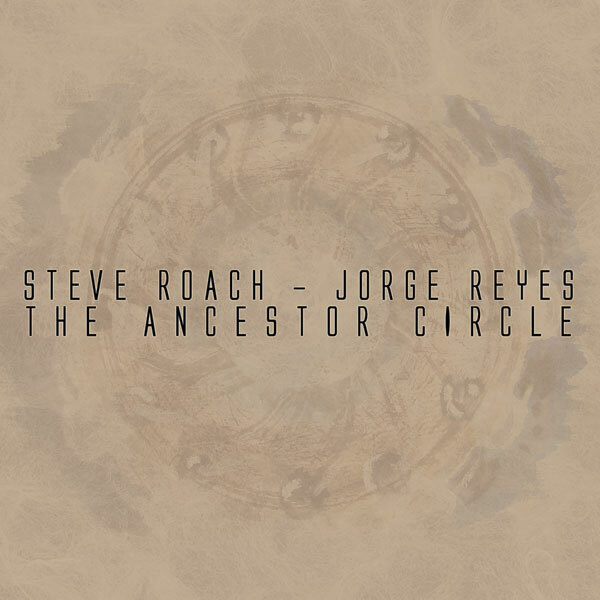 The Ancestor Circle has found its source when Steve Roach discovered a series of music recordings written and played with the missed Mexican musicianJorge Reyes at the time of the album Vine, Bark and Spore in the spring of 2000. The first four tracks are pulled from these sessions while the last two ones were developed in the spirit of May 2000. Steve Roach added new sound elements, bringing a contemporary touch while he reassembled and mixed this album in the same studios, in the summer of 2014. And the spirit of Jorge Reyes is there, without a shadow of a doubt. The cornerstone of this album built around two decades is undoubtedly “Memories Unsuspended”, which seem to drawn its inspiration from the music of the trio Suspended Memories where the duet Roach/Reyes united their atmospheres with the textural guitar of Suso Saiz. The initial winds arise from caves to travel on the desert plains where the singings of the reptiles shiver as the ropes of crossbows. Winds whip these quivering percussions and melt with the shamanic chants while “Memories Unsuspended” shows a kind of crescendo constantly rebuffed by the strength of the static winds and these spectral voices which decorate a contemplative ambient tribal trance. The voices are at times powerful and disturbing, while the percussions, and their organic envelopes, seduce as much as these tides of winds which jostle the wild passivity of “Memories Unsuspended”. The music plunges into a kind of crazy clanic trance with wild incantations, shrill winds and superb percussions, as tribal as organic, which rustle in an opera for spectres of the desert. And big hollow winds calm the violence of the age-old spirits, slowing down the crusade of “Memories Unsuspended” which shares its last 10 minutes between rhythms abandoned in textural ambiences and a shower of synth lines where the shamanic meditative aromas and the cabalistic colors of twilight merge into a fascinating symphony for forgotten ghosts. Each rock that Steve Roach turns in the desert releases a sonic perfume as anywhere else! Whatever in solo or with Vidna Obama, Byron Metcalf or Mark Seelig, the wizard of the contemporary sounds always succeeds so much to astound that to seduce in a music style where lack of originality and feelings led inevitably to the boredom. And so progresses The Ancestor Circle. The ambient passages, in particular the very good “Espacio Escultorico”, are constantly pecked by superb percussions and layers of synth perfumed with harmonies and moods as poetic as sibylline. In order to underline what I am saying you have to hear tracks like “Spirit, Stone and Bone” and “Procession of Ancestors” to seize all the musical depth which bring those percussions along the winds and the strange chants of the breezes which wrap the hypnotic arrhythmic movements of The Ancestor Circle. One would really imagine being near a secret world that Roach depicts with the correctness, the righteousness that we know him for. Ambient, wrapping and intense, “Temple of Dust” abandons a little the prayers and the shamanic trances to offer us these soft meditative soundscapes unique to Steve Roach’s directory. It’s the calm after a violent sound storm where the meditative rhythms are far from being soporific.